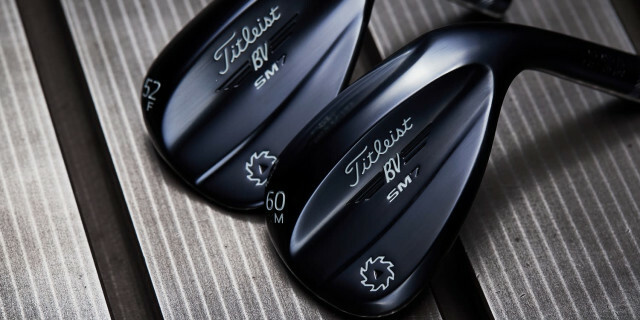 Titleist's highly regarded Vokey SM7 wedges have been given a proper makeover, with the clubs now available in a striking Slate Blue limited finish to provide a confident look at address. For years, Master Craftsman Bob Vokey has stressed the importance of players having confidence in their wedge at address – “A player has to love their wedge when they look down at it” – and finish plays a key role. The finish on Vokey SM7 Slate Blue wedges, available in trusted retailers and through Vokey.com from January 31st, is applied like a PVD finish but with a unique material and more time intensive process that in combination provide a deep, rich slate blue colour that is extremely durable. Consistent with all Vokey SM7 finishes, Slate Blue limited finish is available in all 23 loft, bounce, and grind options (only RH), while supplies last. This exemplifies the Vokey Design commitment to fitting. Finding the proper loft gapping, bounce and grind are critical to execute all of the necessary wedge shots. For help determining the right loft, bounce and grind, golfers can use the Wedge Selector tool on Vokey.com: www.titleist.co.uk/golf-clubs/wedges/selector. Vokey SM7 Slate Blue limited finish wedges will be available in trusted retailers from January 31st 2019 with an SRP of £199. The stock setup features a Nippon Modus3 125 shaft and custom BV Wings New Decade Multi Compound Black Grip. They will also be available for customisation and purchase on Vokey.com. Additional customisations such as character stamping are available for an additional fee. For more information, visit http://www.titleist.co.uk/golf-clubs/wedges/sm7.